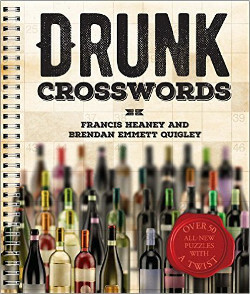 Crossword Puzzles by Brendan Emmett Quigley: CROSSWORD #411: Can You Rephrase That? CROSSWORD #411: Can You Rephrase That? Couple crossword-related links I thought I'd share with you. First up: an NPR podcast featuring solver-extraordinaire Tyler Hinman, crossword blogger Deb Amlen, and some table tennis guy named Will Shortz. Always great to hear people talk about puzzles on the air, and I can't imagine a better group to be doing it. Except for that table tennis guy. Not sure why he was involved. 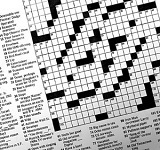 Next up is an article about Matt Ginsberg's crossword-solving AI, Dr. Fill. Sure, this isn't the first AI to solve crosswords, but Matt's is trying to be the best. I've had a few conversations with Matt and we're going to see how Dr. Fill fares with BEQ.com puzzles, probably next month. You know how computer programmers are, always tinkering with their code. So, uh, stay tuned. It's probably worth mentioning that all the names mentioned in this post will be attending the American Crossword Puzzle Tournament next month in Brooklyn. Two more names to add to the list: Liz and Tabitha. So perhaps we will all be meeting up at the hotel bar? Share the puzzle. New one tomorrow.